Rebecca Muir is weeks away from starting college-at a school chosen specifically to put a few thousand miles of freedom between Reb and her parents. But her dad's last-minute job opportunity has her entire family moving all those miles with her! Then there's the matter of her unexpected, amazing boyfriend, Jackson, who is staying behind on the exact opposite coast.If that isn't enough to deal with, Reb's dad drops shocking, life-changing news. Reb started the year knowing exactly what her future would hold, but now that her world has turned upside down, will she discover what she really wants? Why Did I Listen To Return To Me by Justina Chen? I got this brilliant idea to listen to books from my Netgalley queue while stuck making a long commute. It’s like, I am in my car this entire time, might as well make it work for me when it comes to my passion project — this blog. So, the first Netgalley book I decided to check out while commuting was Return To Me by Justina Chen because it’s been on my queue the LONGEST. However, I did not actually make it to the commute. You see, I began this book during the weekend after finishing one audiobook. I COULD NOT STOP LISTENING. So, I actually ended up finishing this one before actually commuting. So, Rebecca Muir is the main character of Justina Chen’s Return To Me. She’s essentially Seattle based, I mean born and raised there. Her family pretty well off and privileged. Her dad is about to be CEO of a different company. Rebecca is ready to start college in New York at Columbia for Architecture. She’s hoping for a great internship as well to start off her summer. Then, she gets the news that her family is relocating to New Jersey so basically relocating with her. THEN, a huge bombshell drops and Rebecca finds herself questioning everything. Also, there’s a boy, and Rebecca wonders if he’s actually trustworthy, unlike her father. Essentially, everything is upended in Rebecca’s life, but there’s healing too and the book is full circle with some unexpected characters that I really ended up loving. I did see that some people were just not into this book because Rebecca is incredibly privileged and it maybe comes across as poor me. That’s actually why I have been putting this book off for forever, because I have little tolerance for that kind of thing. However, I think that listening to this book made me feel a lot more sympathetic to Rebecca’s situation. I think if I had physically read this I would have likely heard a snobby whining sort of voice in my head. Regardless, I was really sucked into this book. I loved how it ended and just how the various threads played out — especially with Rebecca’s grandparents, they play a huge role. They’re great people and play such an interesting role. ALSO! Her mom is pretty great — I mean, in time you find out she’s great too. Also, I have officially realized I am old because I related a lot to her mom. I LOVED IT. I think this is one of my first times listening to Therese Plummer. She has a smooth, melodic voice that sounds youthful without sounding obnoxious. 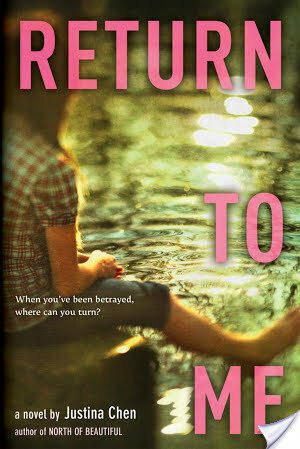 Return To Me by Justina Chen is one of those books that is probably much better via audio than holding onto the physical book. It just was so well narrated. I mean, to the point where I made up things to do so I could keep listening to it. Who Should Listen To This Book? I could not find a more perfect GIF for Return To Me by Justina Chen.